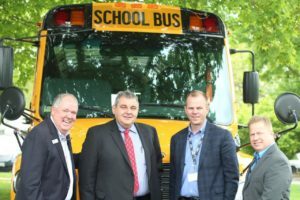 New director of transportation looks forward to being part of the LCS team | Sonny Merryman Inc.
Floyd Merryman, Angel Garcia-Ablanque, Caley Edgerly, and Cory Compton at a school bus luncheon. “You shouldn’t know we exist unless there is a problem. That’s my goal. You shouldn’t be worried about that. That’s my responsibility,” Garcia-Ablanque said this week after being announced as the new director at the Lynchburg City School Board meeting last week. Garcia-Ablanque, who will take over the department of transportation Feb. 1, is coming from Arlington County Public Schools, where he served for two years as the director of transportation. He also served as the assistant director of transportation at Montgomery County Public Schools in Maryland for about nine years. “What [impression] I have so far [of Lynchburg] is this sense of community, family. I’m looking forward to being part of that and that sense of not just being a number, being something to make a change, to add something more to what I know is a fantastic school system already,” Garcia-Ablanque said. “As I told the superintendent, don’t expect changes in the first six, seven months because I need to know what the strengths of my team are, what are the improvement opportunities of the team. If there are any changes that are made, they have to be very small steps because people are afraid of change,” he said. Garcia-Ablanque will be tasked with finding ways to improve services; “being more affective without sacrificing safety;” creating, maintaining and improving routes; handling complaints; deciding when to buy new buses or new technology for the buses; reporting data to the state such as how many miles the department drives, how many routes it has and how many accidents drivers have; ensuring drivers are properly trained and more. He will replace interim Director of Transportation Richard Burge. Lynchburg City Schools’ Deputy Superintendent Ben Copeland said one of the challenges Garcia-Ablanque will face is the driver shortage, which is a national issue, and “how you adapt from those driver shortages to meet the needs of the school division and still operate efficiently.” Currently, the division has about 130 drivers. The LCS website shows job postings for 8-hour and 6-hour drivers, substitute drivers and substitute bus assistants. Garcia-Ablanque said before addressing any driver shortage, he needs to find out why the division has a shortage, whether it’s lack of leadership, a benefits or salary problem or other reasons. “That’s going to be my first priority, to try to keep what we have and try to increase our ranks because at the end, students shouldn’t be suffering because we don’t have the drivers or the equipment,” Garcia-Ablanque said. Susie Rose-Roberson, a parent of two Sandusky Elementary School students, said she hopes Garcia-Ablanque can reduce the driver shortage so “we won’t have to worry about who’s going to be on the bus,” and the division can have enough drivers to replace those who call out on any given day. LCS has “a dedicated core of drivers,” Copeland said. “We have drivers out there that are graduates of LCS. When you have that deep of a relationship, I think that’s something [Garcia-Ablanque] will find unique to Lynchburg,” Copeland said. Rose-Roberson said she’s proud of the drivers LCS has, and she loves her children’s bus driver, but there are some glitches the transportation department needs to fix. One issue she faced was finding out bus drivers are able to drop young students off at their stops without anyone being there waiting for them. Rose-Roberson said she wasn’t aware of the policy that allows drivers to do so. Rose-Roberson said having a meeting between the director of transportation, drivers and the parents can help educate parents on policies the department has and how it works. “There are a lot of parents as well as myself who are not exactly sure what the policies are. We get a letter at the beginning of the year when you register your child for school, but I don’t think it covers all the bases of what is going on in transportation. I think if they had a meeting… they can fully explain to everyone what’s going on. Then it would be a better way of communicating,” Rose-Roberson said. Garcia-Ablanque said education and communication on “what we can do, why we do the things we do and the way we do it” are key when it comes to resolving issues with transportation. A focus of Garcia-Ablanque’s as he leads the department is to create synergy between bus drivers and teachers and staff members. “One of the biggest problems that we have on what I call the back-end of the house, the supporting services of the school system, is the school doesn’t understand what we do, and we don’t understand what the school does,” he said. “There are no longer pockets where it’s all white or all African American. Now it’s a mix of different races, different cultures, different styles of life. My drivers need to understand that the same way teachers do,” he said. Together, bus drivers can help teachers identify students who are having trouble behaviorally or emotionally and vice versa. Because bus drivers are usually the first and last person from the school division a student sees every day, Garcia-Ablanque said drivers have the biggest potential to influence a student. “We say that a teacher has the potential to influence a kid for life, however, a teacher may see a kid for 180 days, 200 days depending on the school year. However, if the kid never moves and the driver never moves, that driver may drive that kid from kindergarten to the last day of high school,” he said. Besides his drivers having influence on students, Garcia-Ablanque wants to personally make an impression on students. He said with a diverse division, many don’t see themselves reflected in schools’ staff, or if they do, they see themselves in the support staff. “Just by me being here, I can tell a kid of Hispanic descent, ‘Yeah, you can become me. However, it takes a lot of hard work.’ I just want to break some stereotypes, break some preconceived ideas that they may have that ‘Oh, because I’m from this cultural background or from this social economic [background], I cannot get there.’ That’s not it. The kids need to understand they can do whatever they want if they put their minds to it,” Garcia-Ablanque said. Story originally published by The News & Advance.